Conor Lamb’s big win in Pennsylvania highlighted the ability of a superior Democratic candidate, well-suited for the district, to win a highly gerrymandered, strongly Republican seat with a strong Democratic, even slightly progressive, message. On the flip side, the election also highlighted the absolute dearth of policy ideas on the Republican side as well as the ineffectiveness of the few that they have. As Jon Favreau pointed out, Lamb ran on traditional Democratic themes. He was for universal health care, medical marijuana, and supported a woman’s right to choose while being personally opposed to abortion. He opposed Trump’s tax cuts as well as any proposed cuts to Social Security. He was a strong supporter of unions and relied on their support to drive his win. And, despite downplaying gun control as an issue, he even supported expanded background checks. Saccone may have not have been the strongest candidate but he was hardly a Judge Roy Moore. His right-to-work stance certainly hurt him with the union vote. On the other hand, this district was gerrymandered so Republicans would always win and the party and its benefactors spent over $10 million on his behalf. And he still couldn’t win. Saccone’s stated positions were lower taxes, replacing Obamacare with “free-market” solutions, and claiming he was “Trump before Trump”. But the tax cuts passed earlier this year showed no resonance with the electorate, primarily because the benefits to the working class were not only so minimal but also overstated and oversold. In addition, adding another $2 trillion to the national debt eliminated any campaign about fiscal responsibility and added to voters’ fears that Social Security and Medicare would actually be targeted, as Paul Ryan and others advocate. Similarly, the health care issue worked against Saccone as that issue becomes increasingly important for voters. The mantra of “free-market” solutions is now taken to mean basically repealing Obamacare and putting nothing in its place. After all, Republicans spent all of 2017 trying to do exactly that. Voters are also conscious that Trump and the GOP, having failed in repealing Obamacare, are now trying to sabotage it in every way possible. In the end, Saccone had no issues to actually run on, as tax cuts and repealing Obamacare are really the only significant policy positions Republicans advocate anymore. Every other policy position Republicans have is basically a denial of what Democrats propose to do. There is nothing positive. As the campaign ended, Saccone was reduced to claiming that Lamb and the Democrats “hate America, Trump, and God”. We saw a similar situation in Virginia where Ed Gillespie couldn’t gain traction on any issues and went full on hate at the end of his campaign which ended with the same result as Saccone but by a much wider margin. Donald Trump was a deeply flawed candidate who never should have been President and only became so with a huge dose of help for James Comey and the mainstream media. But what people forget is that Trump was viewed as a moderate on policy. Many Republicans feared he was a Democrat at heart. He vowed to protect Social Security and Medicare as well as Medicaid. No one believed his position on abortion, thinking his anti-abortion position was simply political expediency. He promised to replace Obamacare with something even better and cheaper as well as tax the rich. He combined those traditional Democratic positions with a xenophobic racism and healthy dose of protectionism that was going to restore the white working class. What we got instead was traditional Republican orthodoxy, an attempt to take health care away from millions and a huge tax cut for the rich. Trump’s efforts at protectionism are recognized as having very little impact on job growth and actually threaten the viability of many more jobs. At the same time, Trump’s cronyism, grift, narcissistic personality, and downright meanness are turning off suburbanites at an alarming rate. 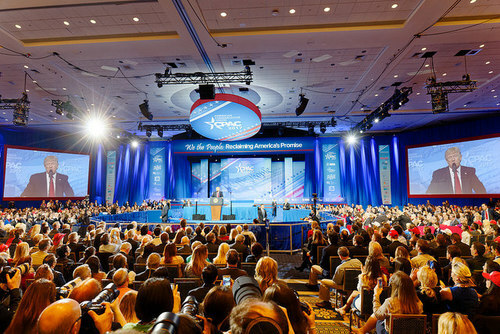 A perfect example of the empty cupboard of policy in the Republican party is to see what has happened to the annual CPAC convention. Yes, it always had it’s share of crackpots but it also had some real discussions about policy issues. Now it’s simply become a haven for the alt-right, conspiracy theorists, and screeds of grievance where someone as traditionally right wing as Mona Charen gets booed off the stage and escorted out of the conference for her own safety. That leaves very little room for a Republican to maneuver politically. There are no policies to run on and simply being “Trump before Trump” is not a winning formula.